I toured around the South Pacific. My husband and I went on a big trip involving a number of different countries situated in the South Pacific. En route to New Zealand, I was expecting to have a six-hour layover at LAX where I'd planned to blog about the challenge of staying on top of a running schedule whilst travelling. We ran into some flight problems and spent most of the time in L.A. working to re-book our travel plans instead. Isn't it ironic ... don't ya think? After a week and a half in New Zealand, we headed to Sydney and then onward to Oahu. I ran once the whole time we were away. A view from my one and only run while on vacation. 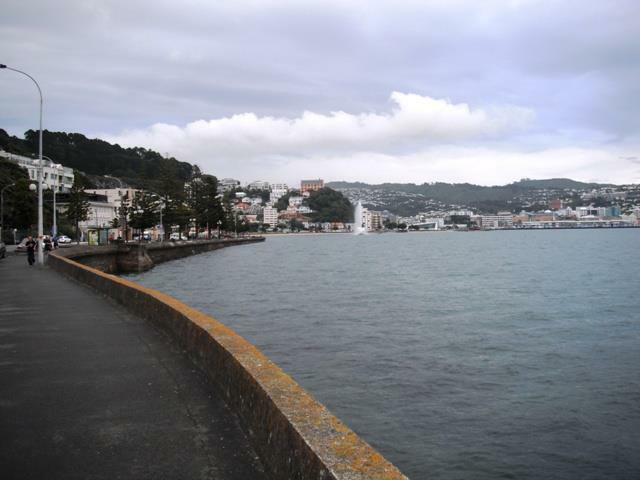 This is Oriental Bay in Wellington, New Zealand. Upon our return home after three weeks away, I suffered from some mega fatigue, fighting off a cold and working hard to get back into everyday life after being on holiday. I didn't run or get to Crossfit for another two weeks. Having fallen off the workout wagon for more than five weeks, when I finally managed to get my running shoes back on, I felt like a complete train wreck. It was like starting all over again. I was not a happy camper. That's my February and March, in a nutshell. Sorry to have been away so long, but with the weather turning a little nicer and me getting back on track, I'm optimistic that I'll be back on the blog a bit more now, too. As Florence says, "Regrets collect like old friends. It's hard to dance with a devil on your back, so shake him off." Words to live by.